William F. M. Arny, general agent of the National Kansas Committee, wrote from Chicago, Illinois to thank William Barnes, secretary of the New York State Kansas Committee, for sending funds. He also wrote to solicit additional funds to support the free state cause in Kansas. 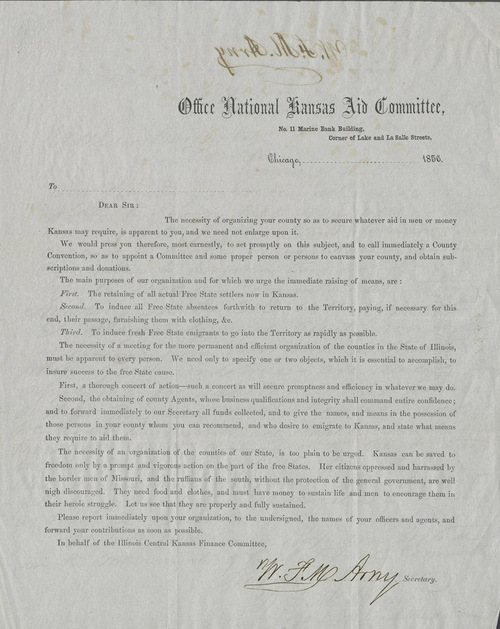 The letter includes a printed form letter describing the National Kansas Aid Committee as well as the handwritten letter to Barnes.